Posh boss Grant McCann looking unhappy at Oldham. Photo: Joe Dent/theposh.com. 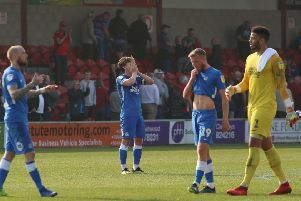 Peterborough United manager Grant McCann admitted his side got exactly what they deserved from tonight’s (September 26) League One trip to Oldham - absolutely nothing. Posh went down 3-2 at the team who started the day bottom of the table even though they played against 10 men for the final 30 minutes. Posh striker Junior Morias is stretchered off at Oldham. Photo: Joe Dent/theposh.com. Oldham’s 10-men scored twice to make goals from Marcus Maddison - a penalty on his 24th birthday - and Jack Marriott irrelevant. “We deserved nothing,” McCann stated. “That’s the worst we’ve been all season. We’ve been very good on the whole and the start to the season remains good, but we were way off our own standards. “Oldham were galvanised by a new manager. Teams always get a bounce when that happens as players suddenly feel they have a point to prove. We played like we had nothing to prove and that was very disappointing. Top scorer Jack Marriott (hidden) scrambles home the second Posh goal at Oldham. Photo: Joe Dent/theposh.com. “Oldham had more belief than us which was surprising. They played at a better tempo. They deserved to win. They were better collectively and individually. “We made poor decisions. Our tempo was slow. We were taking too many touches. “It looked like we would get something from the game when they went down to 10 men, but although we huffed and puffed we didn’t create enough. “Oldham is a tough place to come. It hasn’t been so far this season, but mark my words it will be as the season wears on. Posh lost striker Junior Morias to a first-half thigh injury and he will be sent for a scan tomorrow (September 27). Posh midfielder Gwion Edwards missed the game because of a groin strain. He faces a further two weeks on the sidelines. Midfielder Anthony Grant will be available on Saturday after serving a one-match suspension tonight.